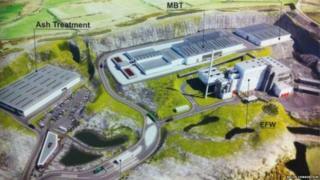 A controversial waste incinerator has restarted its journey through the planning process. Fresh environmental information has been submitted in respect of the £300m development near Mallusk, County Antrim. Approval for the incinerator was overturned in the courts in July 2018. The appeal court ruled that a senior civil servant did not have the power to grant it planning permission in the absence of an executive minister. Legislation was later brought forward by the secretary of state legislation to enable civil servants to take decisions if they were in the public interest. The incinerator plan is now being looked at again by the Department for Infrastructure. All new information submitted has effectively restarted the decision-making process. Opponents vowed to fight on claiming developers had "disregarded the concerns" of thousands of objectors. A spokesman for an umbrella group for the councils involved in the waste project, Arc21, said the incinerator would bring waste management in Northern Ireland "into line with European best practice" and improve recycling rates, reducing reliance on landfill and the export of waste. The project has been on a roller-coaster since its inception. It was rejected by a former environment minister in 2015 before being recommended for approval after a planning appeal. It was then approved by a senior infrastructure official in 2017 before a successful legal challenge by objectors overturned his decision. The proposed project would take 300,000 tonnes a year of black bin waste from six super-councils. Recyclables would be removed before the residual waste is burned. Developers claim it would help Northern Ireland meet targets on diverting waste from landfill; save councils substantial sums in landfill tax and eliminate the possibility of hefty fines for missing waste targets. Opponents claim it's not necessary and would disincentivise recycling. The incinerator plan is backed by officials within the Department of Agriculture, Environment and Rural Affairs, which has responsibility for waste. The developers have urged planners not to delay on a decision. They say there's a danger private investors may lose confidence in the project and that could call into question £50m of public money which has been leveraged in, but which is dependant on private sector involvement.